If you try to maintain a healthy diet, you probably already know that snack foods and chips are full of fat and calories. But are any chips healthy? And how do chips calories compare? 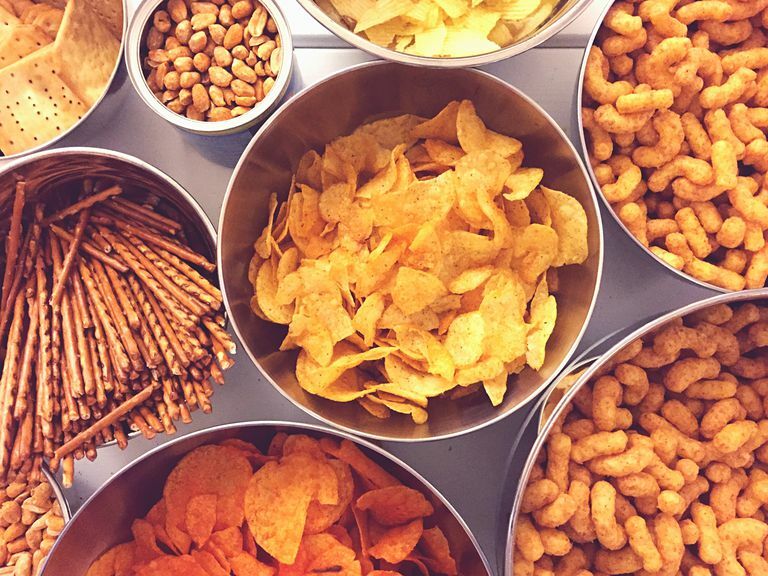 While you're not likely to find snack chips with health benefits, there are a few choices that are better than the rest. Many healthy eaters choose Sensible Portions Garden Veggie Straws when they are craving a crunchy, salty snack. You can consume a hearty portion (38 straws) for just 130 calories. But are Veggie Straws healthy? While this snack food does provide some benefits over traditional potato chips or cheese puffs, eating veggie straws is not the same as eating vegetables. Sensible Portions snacks are made from potato starch, potato flour, cornstarch and other ingredients for flavoring. The snack provides slightly less fat than traditional potato chips but does not provide the health benefits you gain from eating fresh whole veggies, like vitamins, minerals, and fiber. So how do Veggie Straws compare to other popular snack foods? A single serving of most snack crisps or chips is about one ounce or 18 chips. A single serving of Lay's Baked Potato Chips provides 120 calories, 2 grams of fat, zero grams trans fat, 23 grams of carbohydrate and 2 grams of sugar. A single serving of Sea Salt Potato Popchips provides 120 calories, 4 grams of fat, zero grams trans fat, 19 grams of carbohydrate, 0 grams of sugar and one gram of protein. A single serving of Pringles Reduced Fat Original provides 140 calories, 7 grams of fat, 17 grams of carbohydrate, and 1 gram of protein. Your best bet when looking for a crunchy snack chip might be Beanitos. A single serving of Beanitos Baked Black and White Bean Skinny Dippers provides 90 calories, 2 grams of fat, 0 grams trans fat, 19 grams of carbohydrate, 1 gram of sugar and 5 grams of protein. Most traditional snack chips provide between 150 and 200 calories per serving. A single serving of regular potato chips provides 160 calories, 10 grams of fat, 15 grams of carbohydrate, and 2 grams of protein. A single serving of Cheetos Crunchy provides 150 calories, 10 grams of fat, 13 grams of carbohydrate, 1 gram of sugar and 2 grams of protein. A single serving of Fritos Original Corn Chips provides 160 calories, 10 grams of fat, 15 grams of carbohydrate, and 2 grams of protein. A single serving of Pringles Original provides 150 calories, 9 grams of fat, 15 grams of carbohydrate, and 1 gram of protein. And while you might think that popcorn is a healthier option, that might not be the case when you buy the pre-packaged variety. A single serving of Smartfood White Cheddar Popcorn provides 160 calories, 10 grams of fat, 14 grams of carbohydrate, 2 grams of fiber and 3 grams of protein. Baked Versus Fried: Which Is Better? There is a heated debate among health experts about which is better (or worse) for your diet, fried chips or baked chips. Advocates of baked chips point to the fact that fried foods are higher in saturated fat, total fat, and calories. Fans of fried chips say that their products generally provide fewer unnatural and processed ingredients. So who is right? The fact is that chips are a source of empty calories—whether they are baked or fried. You're not likely to gain any health or nutritional benefits when you indulge in these snack foods. These foods also tend to boost your daily sodium and starch intake. So the healthiest snack food for you is probably the one that you are likely to eat less of. It is fairly common for us to overeat foods that we perceive to be healthy or at least healthier. It's called the health halo effect. We feel that certain foods either provide a benefit or do less damage so we are less careful about how much of the food we eat. To keep your healthy eating program on track, check your portion size and try to eat just a small amount —regardless of whether the chips are baked or fried. Believe it or not, the way you store food (including chips) can have an impact on your diet and the number of chips calories that you consume. Studies have found that where we keep snack foods in the kitchen can have an impact on your total daily calorie intake. So where should you store your snacks? Experts say you should keep them tucked away. High cabinets or low cupboards are best. If you have to work a little harder to get to your favorite snack foods, you're less likely to mindlessly indulge. Don't keep snacks on the counter. Your kitchen counter is the worst place to store your chips and snacks. Why? Because you'll be more tempted to eat when you're not hungry if you see these foods more often. Store snack foods in the original bag or box. While storing chips in a resealable plastic container may help to keep them fresh longer, you lose the benefit of the Nutrition Facts label when you throw away the package. By keeping your chips in the original container, you have a regular reminder of the calorie and fat grams as well as the standard serving size. And lastly, when you choose to enjoy your favorite chips or snacks, never eat directly out of the bag. It's nearly impossible to keep track of how much you're eating when you mindlessly snack out of the package. Instead, take just a small handful of chips and put them in a bowl.